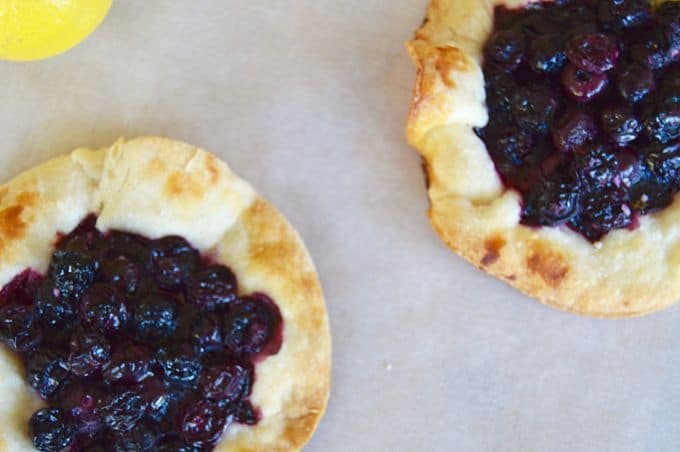 Blueberry Thyme Mini Tartlets are the perfect use of fresh blueberries. 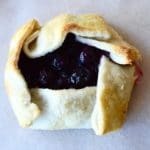 Just a few simple ingredients but when mixed together it’s bursting with juicy sweet blueberries with hints of citrus and thyme all wrapped in a flaky buttery crust! When Blueberries are in season they are amazing. Tart, tangy, sweet and full of fresh juices. I could eat them all day long. I love to take advantage of fruits of the season and bake them into small desert servings. 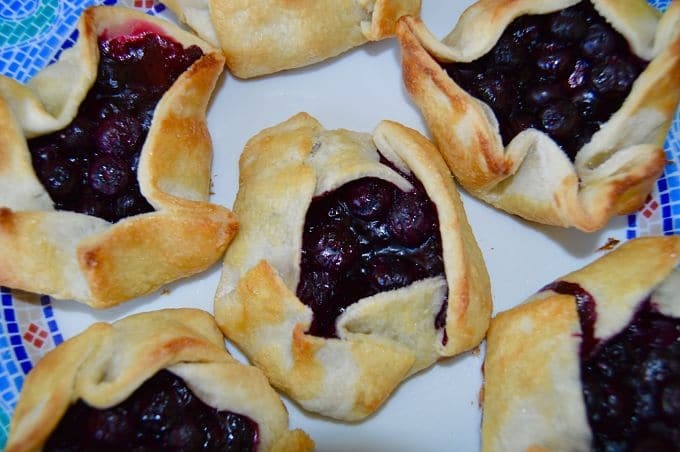 Alas, this recipe for Blueberry Thyme Mini Tartlets!! There is something adorable about having little individual servings of deserts on plates to present. I mean really…tarts, tarts everywhere! LOVE LOVE LOVE! The fact that they are simple to make is an added bonus. 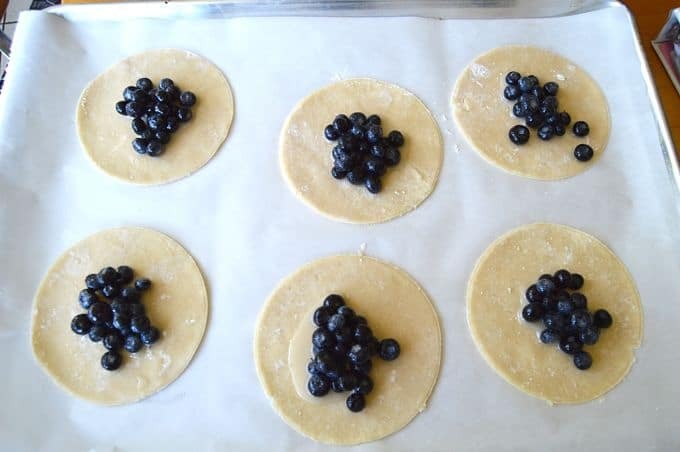 I use a sweet dough that my grandma made and a pretty standard method for the blueberries. Seriously, when I was looking up recipes for this, almost every recipe I found followed pretty much the same guidelines. I guess that goes to show you that you don’t mess with simple good ingredients when cooking. Since the blueberries are in season, I did find that most recipes used way too much sugar so I cut way back on that in this recipe. For 2 1/2 cups of fruit, I used only ¼ cup of sugar. I added fresh thyme that brought just a little zing to the blueberries. Combined with the lemon juice it was a heavenly mixture. The sugar dough mixes up just like a pie crust, I just gently mixed it together and rolled it out. I had a bowl that was about 6” in diameter that I traced around to get the individual shapes. Then put a dollop of fruit in the center. Cut Rounds with spoonfuls of yumminess! You can either form the crust around them, or you can do “fruit Pizza” like these two are. (Yes, even mistakes work out ….these for some reason when I did them didn’t stay all nice and tucked in. But they came out just as yummy as the ones that stayed together!! When the crust fails(falls back)it becomes Fruit Pizza! Looking for other fresh fruit recipes check out my Cherry Apple Pies, Strawberry Rosemary Muffins or another blueberry recipe in Lemon Blueberry Muffins. 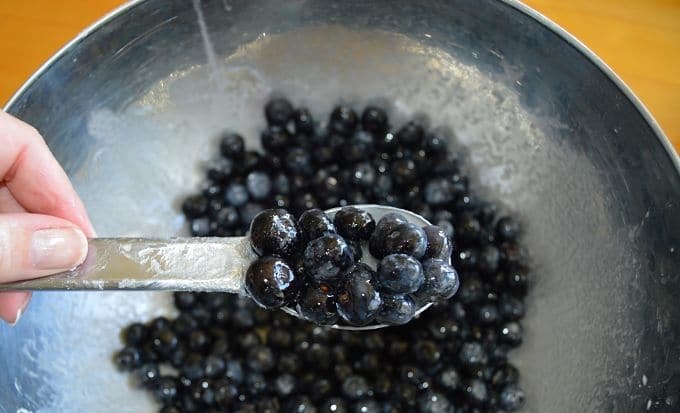 Looking for the perfect recipe to use those fabulous blueberries? Look no further, these blueberry thyme mini tartlets are the perfect use of them! You'll be the hit of where ever you decide to bring them! With your hands, mix butter into flour mixture until it is meally looking. Sprinkle iced water over the top of mixture slowly bringing dough together. Add the water a little bit at a time. DO NOT Over mix, you want the dough to just barely bind together. Separate into 3-4 discs and wrap each one individually with plastic wrap. Roll out one disk at a time to 1/8" thickness,cutting them into 5-6 inch rounds(use a bowl to trace around). Either leave dough flat (for pizza looking finish) or fold over edges like a tartlet. Place on parchment paper lined baking sheet with 2 inches between tarts. Brush tarts with egg wash and sprinkle generously with sugar. Bake at 425 for 12-15 minutes until crust is golden and blueberries are bubbly. Turn tarts at 7 minutes to allow for even browning. Allow 15 minutes to cool before removing from the baking sheet. In a small bowl squeeze lemon juice and add cornstarch and thyme to it. Mix well. In a larger bowl add blueberries and sugar and mix. Pour lemon juice mixture over the top and blend well. Let blueberries sit for at least 15 minutes before spooning onto tart dough. These are adorable! And they look so easy since they’re free-form! They just make me smile because they are small and I don’t feel guilty about eating one all by myself! Perfect dessert for entertaining! Love blueberries in everything! Those 2 little “mistakes” ? Those are MINE ! HA! You just made me smile, thats what I say when there is a delicious food failure! 🙂 More for me! I love blueberries and thyme! I bet these would be great. I love that they also look relatively easy to make. Thanks for sharing the recipe! These are such cute little tartlets! I would not have guessed that they were so easy to make. Thank you for sharing the recipe! Yum! This sounds so good! I can’t wait until blueberries are in season here in Maine – one of my favorites! I love that these are tartlettes! I am a nibbler so these are perfect to pop in my mouth. I’m not so sure my figure will be as happy about it. Omg how yummy are these?!?! I just love all things blueberry. Must give these a try!!! Michele blueberry thyme sounds like a wonderful flavor combination. Something make me things basil or rosemary might work well too. These look amazing! I love all things blueberries and I love that you use real fruit and not canned or frozen! Your pictures are making my mouth water! Oh goodness, those look so amazing! I don’t even like blueberries and I want to eat this! This sounds absolutely amazing and fresh! I am going to have to try this soon! Love blueberries! wow, how mouthwatering are these. Love blueberries, have a pile of them growing. Must do this with them this year. Oh wow these look absolutely delicious! My husband and I take turns surprising each other with breakfast on the weekends, so I might have to make these as a sweet treat! we have a pick your own blueberry farm near our house. I’ll remember this recipe when they are ready to be picked. This is a fabulous alternative to bluebeerry pie! Can’t wait to try it! Oh yes. This would make such a great dessert for company. Love the blueberries but the options are limitless. What is this and why is this the first time I’m seeing this!? This looks SO amazing! I want to make these right now! These sound so yum! The thing is, I would seriously sit down and eat like 13 of them in one sitting. That’s ok, right?